Today’s Sunday Brunch looks at the State of Children’s Books, lists the winners of the Sydney Taylor Awards, starts a feud with School Library Journal’s Newbery bloggers, and explains why I, a “louse,” have been “laughed upon and ridiculed” on this road of life…. Well, President Obama has told us that the state of the union is strong. What about the current state of children’s books? In recent years, there seems to have been a shift in the age parameters of children’s and young adult books. On the higher end of the spectrum -- perhaps led by the success of Stephenie Meyer’s “Twilight” series -- there appear to be many more adults now reading YA novels. Hey, I love it -- the more the merrier. But a controversial New York Times article suggests that picture books for pre-readers or beginning readers are not doing well. Sales have slowed and some publishers are releasing 25% fewer picture books than they did in the past. Some say this is due to the economy; others say that many parents are bypassing picture books in order to push their kids into storybooks and novels before they’re ready for them. How this will affect visual literacy or a lifelong love of reading remains to be seen…. Books for young readers are getting bigger. I don’t need any stats to back this one up. Just go to any bookstore or library and look at the fat volumes on the “new book” shelves. Personally, I attribute this to the Harry Potter phenomenon. When publishers became aware that children had no problem reading those behemoth volumes, it seemed as if every subsequent book began gaining weight. Sometimes it’s justified; some novels do require more time and space to tell a tale. Many times, however, these weighty volumes are excessively wordy, poorly-paced, and could be easily cut by a third or a half. What’s that all about? People keep telling me that editors these days are more interested in “acquiring” manuscripts than actually editing them. I’m not sure that’s true, but if it is, it might explain a lot. I’m also intrigued by a third type of book -- the relatively short novel that, due to a large font and a small trim size, ends up at several hundred pages. Two of last year’s most acclaimed titles, THE DREAMER by Pam Munoz Ryan (384 pages) and KEEPER by Kathi Appelt (416 pages) are good examples of this trend. What does it mean...? Another recent trend is the explosion of high-concept titles -- novels with a “hook” that can be sold in a single-sentence book talk. Vampires. Werewolves. Dystopias. Super wealthy kids. I guess part of the appeal is escapism, but an occasional story about a complicated friendship or complex family situation would be nice too. Your chances of dealing with a problem-friend are much greater than your chances of being the last person alive on earth or having a vampire boyfriend…. Kindles…Nooks…E-books. How are they going to impact the world of children’s books? No one knows for sure. But one word I keep hearing bandied about is “boutiques.” Just yesterday I read a Publishers Weekly article which described the Dutton Children’s Books transformation to a “boutique middle grade and young adult imprint with a focus on titles of exceptional literary quality and strong commercial appeal.” I’m also hearing the electronic book phenomenon may cause the book superstores to topple, but some independent booksellers will survive by becoming small “boutiques” specializing in printed books. Will “boutique” be the children’s book word for the future…? Although the “state of children’s books” mentioned in this blog may sound worrisome, there is also heartening news. Kids’ books have a huge presence on the web, with so many bloggers that you couldn’t keep up with them all even if you tried. Children’s books are getting more notice in the media (well, except for the TODAY show) with more and more movies and TV shows being made from books for kids -- which in turn brings readers back to the original books. And the fact that the annual children’s book awards can still surprise us with its selections, PLUS honor debut creators such as Erin Stead and Clare Vanderpool, shows there is always great new talent joining the field and providing a lot of hope for the future. So perhaps, after all, the State of Children’s Books is stronger than we think! As a kid, I was an aspiring writer. I dreamed of the day when I’d sit in a bookstore signing copies of my latest novel for legions of adoring fans. But I recently realized that signing books isn’t such a rarified activity. 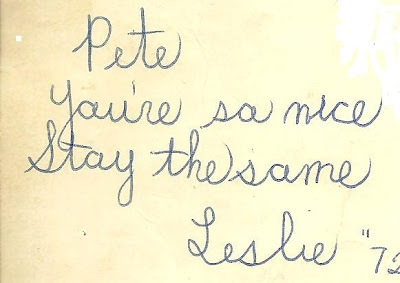 It dawned on me this past week when I happened upon one of my old yearbooks and saw all the inscriptions inside. It made me realize I’ve been signing books all my life -- yearbooks. We’ve all done it – even those who have never had any literary aspirations. 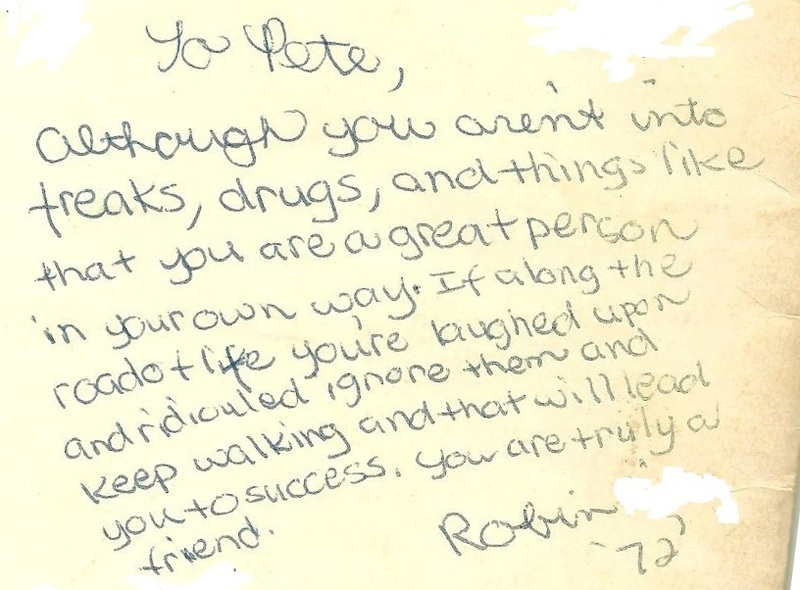 As I flipped through my junior high school yearbook, I looked at the faces of my old classmates with nostalgia…then I turned to the “autograph” section on the back inside covers and remembered what a bunch of jerks they were. Reading their comments was like looking at a yearbook belonging to Dawn (WELCOME TO THE DOLLHOUSE) Wiener. This next one was signed in pencil. Is it too late to erase it? And here's a note from the friendly thirteen-year-old pothead who sat in front of me. How many back-handed compiments do you count? 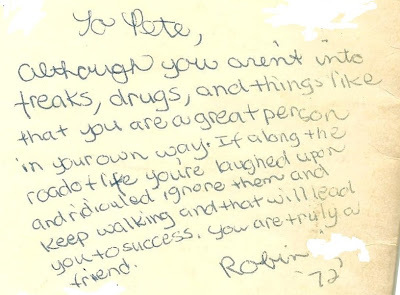 Actually, I'm rather amazed at Robin's prescience. How did she know I'd be "laughed upon and ridiculed" along my road of life? I just wish she'd been right about the "success" part, though. I've endured the laughter and ridicule, but the success is still eluding me. 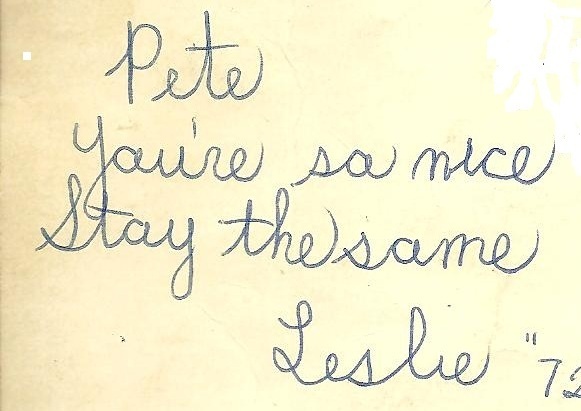 On a happier note, I also took a look at my high school yearbook from several years later and all the inscriptions were exceedingly nice. 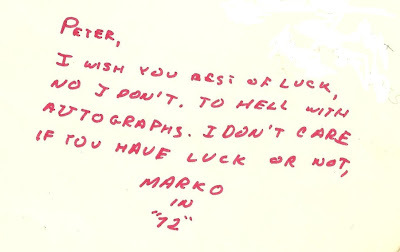 Maybe that's because I didn't ask Dave, Karen, Mark or Robin to sign that yearbook. And maybe I'd become better at selecting friends. 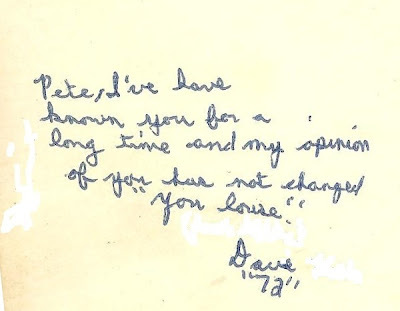 By then (to use a favorite quote from a new YA book, PLEASE IGNORE VERA DIETZ by A.S. King) "I knew not to give the best of myself to the worst of people." My trip down memory lane, as bitter (and somewhat comical) as it was, got me wondering about the yearbooks of famous children's book writers. Wouldn't it be fun to open your old high school annual and realize that classmate Maurice Sendak had provided some of the artwork way back in 1946? Sendak is one of many illustrators whose early work appears in his high school yearbook. John Schoenherr, Trina Schart Hyman, Nancy Ekholm Burkert, and Charles R. Smith Jr. also contributed art to their high school volumes. 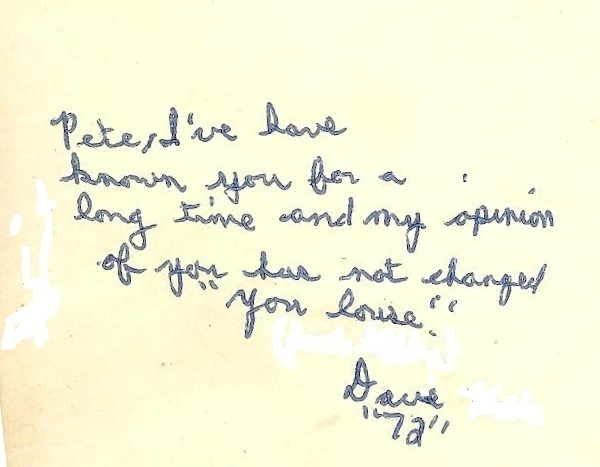 David Macaulay was named “Best Artist” in his high school yearbook, and the words "Future Novelist" appeared under Lois Lowry's senior picture. Daniel Handler ("Lemony Snicket") was voted "Class Clown" and "Friendliest" in his yearbook, while Theodore Geisel ("Dr. Suess") was chosen as "Class Artist" and "Class Wit." When she appears at speaking engagements, author Claudia Mills often entertains her audiences by doing the "Ape Dance" that she invented when she young. Her high school yearebook includes a photo of her doing the dance. My favorite yearbook story concerns, by chance, my favorite author. Marijane Meaker ("M.E. Kerr") attended boarding school in Virginia and was expelled for throwing darts at a dartboard decorated with photos of teachers cut from an old yearbook. Her suspension ended up affecting her own status in the yearbook. By the time she was reinstated to the school, her senior yearbook had gone to press and her photo could not be included in the alphabetical display of graduates. It had to be slapped onto the last row of pictures, after her classmates whose names ended with X, Y, and Z! AS THE MOON SETS ON HEAVY MEDAL, WE SAY, "HI BOB!" Over at the School Library Journal, the annual Battle of the Books is about to begin. BOB is described as "a competition between 16 of the very best books for young people of the year, judged by some of the biggest names in children's books." I'm glad BOB is starting up just as the Heavy Medal blog is closing down for the year, as I will miss all the Newbery discussions. And I especially don't want to hurt anyone's feelings, as the folks at HM are great. I've corresponded with Nina a few times and she seems really nice, and I've known Jonathan forever and he's a friend. But was anyone else disappointed that, after months of discussing every aspect of the Newbery -- what should win, what shouldn't win, why some books didn't cut it as contenders, why others were better suited for the medal, parsing every official rule and regulation, etc., etc. -- that we never did get a final blog telling us their opinions on MOON OVER MANIFEST and whether it was the best choice for the Newbery? Unless I missed something, the only statement we got from Nina was, "MOON shows remarkable complexity and attention to audience in its multilayered 'interpretation of theme or concept'…a confluence of themes of 'story,' 'home' and 'belonging.'" And Jonathan says he's still on the library waiting list to get a copy of the book! My suggestion: buy a copy of the book. I know, times are hard and books are expensive but, c'mon, it's a good thing to support the Newbery...and support the children's book industry that we work in. When you're done with the book, you can donate it to the library. Give it to student or library patron. Write if off on your taxes. If that's not possible, contact the publisher and see if they can send a review copy for Heavy Medal -- I'm sure your blog is famous enough to merit a review copy. Heck, if it comes down to it, I will cash in 170 of the empty Diet Coke cans in my garage, go buy a copy of the book, and personally send it to Heavy Medal so you can read and review it. Because closing down the blog without a final judgement on the winning title is like watching an entire season of TOP CHEF and then missing the last episode...walking out of a play at intermission...or eating dinner and having to leave before dessert is served! The Sydney Taylor Book Award is named after the ground-breaking children's author whose "All-of-a-Kind-Family" stories are still read and loved. She was born Sarah Brenner in 1904 and grew up on New York's Lower East Side. As an adult, she changed her first name to Syndney and danced professionally with Martha Graham. She would later marry and have one child. At night she would tell her daughter bedtime stories about her own childhood. She eventually wrote these stories down and put them away, with no plans for publication. from Mrs. Meeks, the Children’s Book Editor of Wilcox & Follett, telling me she wanted to publish ALL-OF-A-KIND FAMILY. I didn’t know what she was talking about. I told my husband and the whole story came out." She later received word that she had won the Follett Award. She also wrote a few stories unconnected with her famous series, but these are mostly forgotten. But sisters Ella, Henrietta, Sarah, Charlotte, and Gertrude (Taylor used the real names of her sisters and herself in the books), growing up poor in New York City remain known today. One of the earliest children's series to feature Jewish protagonists, the books provide insights into Jewish traditions and holidays within the context of warm family stories. The many readers comments on Amazon.com range from "I am Jewish and could relate to the characters" to "I first read this as a child, growing up in the south in a pentacostal holiness church. This book was my very first introduction to the Jewish Faith, what it means and how it impacted day-to-day life." One common theme that runs through the customer comments is that so many readers say they wanted to be part of this family when they were growing up -- surely a sign of the books' success! Thanks for visiting Collecting Children's Books. Hope you'll be back. So, I was sure Sydney Taylor's maiden name couldn't have been Sarah Brennan--I looked it up and it was Brenner, which makes more sense. A few years ago I was thinking about these books and realized Taylor was never specific about what country Mama and Papa had immigrated from. I thought it was probably somewhere in the area of Russia, myself; I took a poll of friends and everyone thought Russia, Ukraine, Poland, places like that, and we were all surprised we had never wondered before. It turns out (as I understand) they were German Jews, which adds an extra note of poignancy. As for Heavy Medal: I could be making up my own thing, so Jonathan and Nina are welcome to call me out, but I sensed a sort of reluctance to criticize Moon Over Manifest, as if perhaps that might seem rude to the committee. Never having been on the committee, and not being a librarian in the first place, I didn't have any hangups about it. Sometimes I read critiques of books I didn't like that much, or liked but didn't find distinguished, that make me reconsider. Even if they don't make me like the book, they make me understand why others did. I've yet to find such a critique of Moon Over Manifest... but I'm looking. Thanks for the correction, Wendy. My source said "Brenner," but I'd been sitting in front of the computer so long that my hands typed "Brennan." Interesting theory on Heavy Medal. I don't know if I agree, but perhaps you are right. I'm going to teach Children's Literature to Korean university students next semester. Your post reminded me of one discussion I definitely want to have with the class -- how picture books are so important in a child's development. Really nervous about doing this class right and eager to get started! I must add All-of-a-Kind Family to my must-read list. haha looking through yearbook posts is both funny and bittersweet-- like revisiting those awkward teenage years that you don't care to remember (but now that you're done, it's okay to laugh about it). loving your blog! Is there a resource that lists all the Weekly Reader Children's Book Club books? I agree that it was disappointing not to have a wrap-up discussion of Moon Over Manifest. 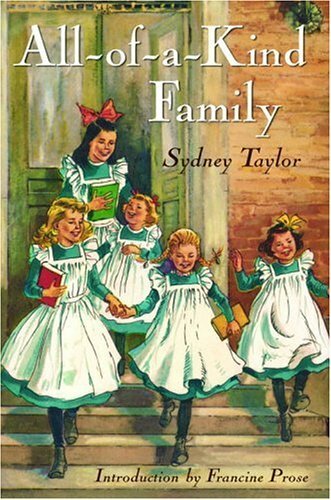 There's some biographical info online about Sydney Taylor- I loved learning that she and her sisters all ran a summer camp together, as I'd come to love the characters and it was lovely to think of them continuing to be together as adults. Didn't know about the final Ella book untik I was grown, and it was a terrific surprise to have one more book in the beloved series.